-In the first Rak-a't after the recitation of Soorah Al Faatih'ah, recte Soorah Al Qadr X10 times. -In the second Rak-a't, after the recitation of Soorah Al Faatih'ah, recite Soorah Al Kaafiroon X 10 times. -In the third Rak-a't, after the recitation of Soorah Al-Faatih'ah, recite Soorah Al Ikhlaas X10 times. -In the fourth Rak-a't, after the recitation of Soorah Al Faatih'ah, recite Soorah Al Falaq X10 times, and Soorah Al Naas X 10 times. O Allah send Thy “the best” blessings on Muhammad and on his children, the chosen successors, and on all Thy Prophets and Messengers; also glorify them with Thy “the best” commendations; and in addition sanctify their bodies and souls. O Allah multiply Thy blessings send on Muhammad and on the children of Muhammad, and give us more and more in this day, which has been rendered superior, chosen for bestowing bounties, distinguished, and whose superabundant generosity is deemed very important. O Allah multiply Thy blessings for me in the bounties Thou bestows on me, through it, till I do not have to flatter any one else other than Thee, and add more and more to my means of livelihood, O the Owner of might and majesty! O Allah let it not be that what has been escaping me may also render Thy support and protection unavailable, and let it not be that which I have lost may also make me miss sorely Thy help, so that I may not take pains in the matter of that which I do not need, O Owner of might and majesty. and bless their souls and bodies. O Allah, if I miss any thing, (please) let me not miss Your aid and custody. so that I will not have to do that which I do not need to do. O Lord of Majesty and Honor! It is also narrated that it is recommended to repeat it 366 times: hence you can commence reciting approx. 1 hour before the time so as to complete the number by then. This EXACT time is also beneficial for seeking Fulfillment of any of the needs. O Allah, the new year has begun. You are the eternal master. I ask You to make available to me its good and the benefits which are in it. I seek refuge with You from its evil and the disadvantages which are in it. I request You to let me procure the provisions I need and discharge the activities I take up in this year. O Allah, I take refuge with the light of Your holiness, greatness of Your purity, and abundance of Your glory, from every misfortune and every injury, and from the behavior of nights and days, jinn and human beings, save the way which leads to goodness, O Beneficent, O merciful. O Allah, You are my help, so from You I seek help; Your are my refuge, so I seek refuge with You; You are my asylum so I seek Your protection. O He who subdues all the strong and the powerful, and bends the necks of all the tyrants, I take refuge with the majesty of Your pre-eminence from the disgrace Your affliction, from the withdrawal of Your protection, from the forgetfulness of Your remembrance and from shirking from giving thanks to You. I am under Your protection day and night, in my sleep and rest, whether in home or in journey. Your remembrance is my daily routine, Your praise is my talk. There is no god save You. Keeping me free from vice on account of Your name, making me revere the grace and beauty of Your honor, protect me from the disgrace You afflict, from Your calamitous chastisement, from the degradation of Your punishment, take me under Your protection and preservation, and give me good in abundance from Your mercy, O the most merciful. (iii) Recite the following thrice on water; drink some and sprinkle some in the house. Allah is my Lord My Lord is one. My Lord is ever living, self-subsisting. My Lord is He who gives life and makes dead. My Lord is single, almighty. Sufficient is my Lord. O Allah, we take refuge with You from abuse, plague, epidemic, misfortune, accidental death, specified calamity, rejoicing of enemies, and from the anticipated evil. O our Lord, turn away the certain torment from us. Verily we are those who know for certain. Allah is sufficient for us. Most excellent is He who protects us, the most excellent Lord, and the most excellent helper. Allah is the best guardian; and He is the most merciful. Blessings of Allah be on the best of all His creation, Muhammad and on his pious and purified children, by Your mercy O the most merciful. O He who opens up doors (opportunities), O the causer of causes, O the converter of hearts and vision, O He who directs nights and days, O He who changes stratagem and circumstances, change our situation into the best condition. and He is the most merciful of the merciful;” and for the sake of Muhammad, blessings of Allah be on him and on the infallible and rightly guided Imams. (vi) Recite the following du-a’a thrice on a glass of water, drink some and sprinkle some in the house. Allah is my Lord. Allah is my Lord. My Lord Allah is one, almighty. My Lord gives life, makes dead, Sufficient is our Lord of us. My Lord, my Lord, my Lord, my Lord, my Lord, my Lord, my Lord. O Allah protect us from famine plague, drowning, burning, death, evil of accidents, hostility of the enemies and the evil deeds recorded in the register. O our Lord keep away chastisement from us through Your mercy O He most merciful, because we are believers, and blessing of Allah be on the best of all that which He has created, who is the symbol of his benevolence, Muhammad and his pious and purified children, and tranquil peace, much and often. - "WA UFAWWIZ”U AMREE ILALLAAH INNALLAAHA BAS’EERUN BIL I’BAAD " Entrust my affair to Allah; verily, Allah keeps an eye on (His) servants. - "YAA RAH’EEMU BIRAH’MATIKA YAA ARH’AMUR RAAH’IMEENO" Merciful by Your mercy, O the most merciful. O Allah, You are everlasting, eternal, ever living, generous, compassionate, liberal. This is a new year and Your are the eternal sovereign. I beseech You to protect me from Shaytan and deliver me from the fire and help me to control inordinate lust and occupy myself in that which bring me near to Your presence O Lord of might and power, through Your mercy O the most merciful. (ix) keep the following as a ta’-wiz on your body. There is no power nor strength with any one save Allah. I seek refuge with the Lord of S’uhaa and S’ah’eehah from the scorpion, the thief and the snake. If the following du-a’a is recited on water for having a bath on the 1st of Muharram ( new year) , you will remain save from diseases and ailments throughout the Year. Glory be to Allah, the supreme balance. Glory be to Allah, the ultimate in gentleness. Glory be to Allah, the goal of devotedness. Glory be to Allah, the splendor of the arsh. 1 - Perform Ghusl. 2 - Put on new or clean clothes and apply perfume. & 3 - Keep fast. 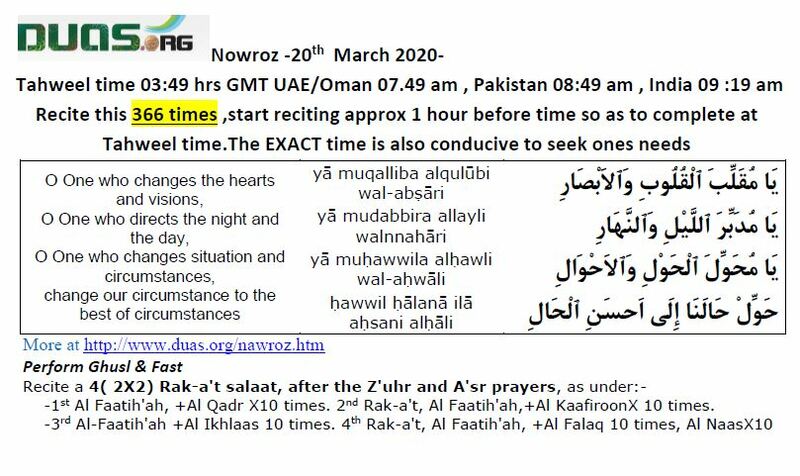 a) In the first Rakat after al Fatiha recite Surah al Qadr 10 times. b) In the second Rakat after al Fatiha recite Surah al Kafirun 10 times. c) In the third Rakat after al-Fatiha recite Surah al Ikhlaas 10 times. O Allah bless Muhammad and his family, the chosen successors with whom You are pleased. And [bless] all Your Prophets and Messengers with the best of Your blessings, and favor them with the best of Your favors and bless their souls and their bodies. O Allah send favors on Muhammad and his family, and favor us on this day of ours which You have given preference, have made noble, honored, and have exalted its significance. O Allah, favor me in what You have bestowed on me in it, until I do not thank anyone other than You. Increase for me in my provision, O Possessor of Majesty and Nobility. O Allah, whatever is hidden from me, let not Your help and protection be hidden from me and whatever I lose, let me not lose Your help with it so that I may not burden myself with that which I do not need, O Possessor of Majesty and Nobility. O One who changes the hearts and visions, O One who directs the night and the day, O One who changes situation and circumstances, change our circumstance to the best of circumstances. O Allah, this is a new year and You are the eternal Master. I beseech You for its good and for the good that is in it. I seek refuge with You from its evil and the evil that is in it. I rely on You for its provision and its activities, O Possessor of Majesty and Nobility. The Muslim community is blessed with having multiple “new years” throughout the year, in which we have the opportunity to take account of our actions and make a change in our lives. These occasions include the beginning of the Islamic new year – the 1st of Muharram which signals the true Islamic new year (rather than 1st January); the Night of Qadr during the Month of Ramadhan which signifies the spiritual New Year in which the affairs of the entire following year are decreed and the third is Nawrooz – the ‘New Day’ - which signals the beginning of spring and a change in seasons – a time which should also reflect a change and a rebirth within our selves. However, Ayatullah Makarim Shirazi cautions that, “Since Mu‘alla ibne Janis is an individual whom the scholars question (and thus this tradition as well falls under question), for this reason, it is not possible to rely on this tradition.” None the less, he states that this day has Islamic significance, which we need to ensure is marked in an Islamic fashion. He concludes by stating that the Eid-e-Nowrooz is an Eid of nature in the world of creation; it is the day when winter ends and spring blossoms with its natural life by the command of Allah. It is the time when the leaves of the trees begin to sprout their buds and the flowers begin to bring forth their bulbs in preparation of their blooming; it is a time when a movement towards life takes hold of all of creation and thus we, the believers, should be in harmony with this event of the creation as this is equivalent to being in sync with the tradition (Sunnat) of Allah. The believers need to ensure that they remove all actions which are ‘cultural’ or ‘traditional’ – even if practiced by Muslims, and to follow the dictates of the Prophet and the Imams. Thus, some of the recommend actions which we should perform on this day include: a ghusl for Eid; wearing clean clothes; applying perfume; fasting, praying the recommended Salat after Salaatul Asr and the various supplications which should be read on this day, some of which are found in Mafaatih al-Jinaan [The Prayer’s Almanac in English by PET] and Mafaatih al-Naveen.